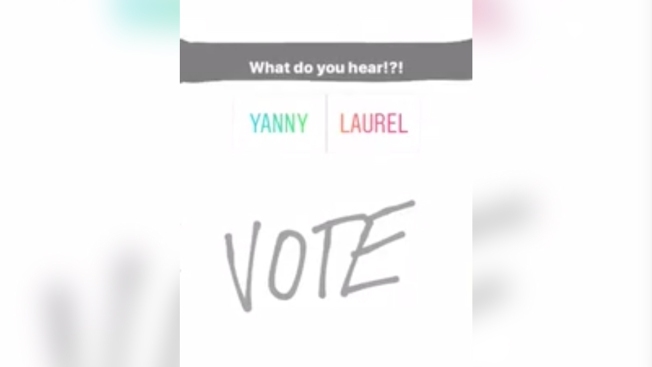 So does the voice say "laurel," "yanny" or something totally different? A screengrab of the Yanny/Laurel Twitter video on May 15, 2018. It's been a while since we've had a good social media debate. Remember when we were all asking is "The Dress" gold and white or blue and black? Ah, those were the days. Now we've found social media's newest controversial question and it has to do with what you hear not what you see. In case you've missed it there is a serious sound question floating around on the Internet right now. There's a sound clip of a voice saying either "yanny" or "laurel" and it's driving people mad. Seriously, don't dive down this rabbit hole if you're not prepared for a little tussle and possibly a little outrage with other's answers. So does the video say "laurel," "yanny" or something totally different? We're not picking sides in this social media debate. Original Post: Laurel or Yanny? Listen to the New Viral Video Driving the Internet Crazy!